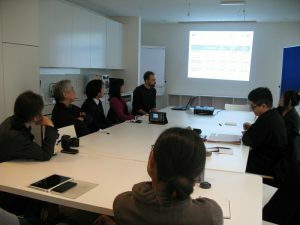 At February 1st, 2016, some of us visit to a solar house in Berlin, Fasanenstrasse. 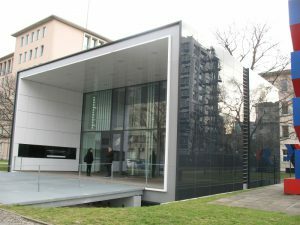 The minister of Environment, nature protection, construction, and reactor safety (Bundesministerium für Umwelt, Naturschutz, Bau und Reaktorsicherheit) built the house as an experiment of energy efficient house. The name of project is “Effizienzhaus Plus mit Elektromobilität.” This means efficient house plus with electric mobility. They built 35 experimental houses in Germany. Each house has own outlook designed by different architect. The house in Berlin is shown in the picture. It has a modern cubic shape. But of course there are houses that outlook is a classic German house, too. The house is called an efficient house however also “plus” is in a name. The goal of this house is to show “generating more energy than consuming it through a year.” This includes the energy of one electric car. In the experiment process, a few public offered families live in each house for a year. Two families lived in this house so far. The house generates energy by solar panels and store it in the batteries. The architect puts the panels on the west and east side walls and the top of the house. It would be more efficient if the panel is at the south wall, however, a typical family consumes energy in the morning, the afternoon, and at night, but not in the noon time. If they use energy directly, it is more efficient. The south side has a large glass window to get the sun light. The architect made outside looking more important than the panels efficiency, so he has chosen a specific color panels but lower energy efficiency (10 to 15%). Heating is the largest energy consuming component of typical house in Germany. Therefore most of the effort of saving energy is related with heating. In this house, the triple layer glass is used for the window. The ventilation system uses a heat exchange mechanism. The heating uses a heat-pump system. Efficient LED lights are used for the illumination. The wall is made of low thermal conductivity materials, yet the material is recycle friendly. All the house system is adapted to use electric energy, then the house doesn’t have other external dependency for energy. The result of the first year did not generate all the energy they consumed. The house could only generate the energy consumed in the house, but not for the car. But this is an experiment. The researcher monitored the energy consumption details in the house and found the two unexpected behavior. One is the low efficiency of heat transfer system. It didn’t work as in the specification from the provided company. Thus, they exchange the device. The second problem was the energy consumption of the living room. This room was connected to the staircase and the heated air just ran away from this connection. So the architect put a glass door. The result of the second year (with the second family) was successful. The house generated the energy more than the family consumed including a car electricity. The architect thought that the motion sensor was good for saving energy for lights, but the first family had a cat. and they found out this was not so efficient. It’s interesting for me that this house just lack of “one door” despite all the high technology for saving energy. The experience is useful. Another interesting issue in the report was about the mindset of the family. The family realized they don’t need to save energy, since the house generate it. So their mind set becomes a bit more extravagance about energy. I understand this, but is it a good for society at the end? I am not sure. This could be a question for the next experience. 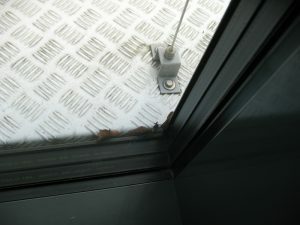 The architect prefers the fixed window, which you cannot open them, for the energy saving point of view. But, the family reported it is important to be able to open the window manually. It is also important for a house not only for the energy, but the house is the big place where the life is going on. So the house keeps the window that you can open them manually. All these results are published as following (online). The following is my personal memo. My first glance of this house was, “I don’t want to live in this house. It looks like a Borg cube!” But this is based on a specific architect and he has also limitation in design. The original plan was for three years experiment for this house and the architect can only use some limited technology. There are 35 different designs of the Effizienzhaus Plus. I found some houses attractive. But I like the inside design of this house. I first said about the design. This means that it is already not the technical issue even in my mind. I felt the design was important. I felt that the technology is matured. I recall when the five color iMac showed up in 1999. For me, the most important factor of a computer is performance, memory, and functionality. I thought “iMac? Power PC 750, 266MHz, sounds nice, but isn’t the main memory too small?” However, some of my friends told about iMac, “Which color did you buy?” I was shocked. Why color? Later I looked back that time, the computer becomes commodity. The design is very important if you put it in a house instead of an office. I understand when something became common in your life, the design matters. The same as this house, the architect chose a specific solar panes color, and he has chosen a low efficiency panel (10-15% efficiency). He had chosen the design over the efficiency, yet to aim the primary goal. For the next generation solar panels, I think they need more colors. I already heard about such research for solar panels. The technology will create the solar panels of any colors, then we will not notice that is a solar panel one day. The design will be more important than the energy efficiency. If a house with green solar panels, you could not distinguish the house and the garden from the distance. Other natural energy generators would go to such direction. For instance, a wind turbine would look not a wind turbine. One direction would be windmills in Netherlands, that made the scenery itself. Or a wind turbine looks like a tree. There is an vertical axis wind turbines. Maybe we could make a turbine that resembles a tree which fits in a forest. The wind turbine area becomes a park mixed the silent turbines and real trees. This is one direction of this technology. One day, we have a power plats that is a natural park. I imagine that kind of the future and I see it is good. There is no English page for this article. Please try other language (Japanese).